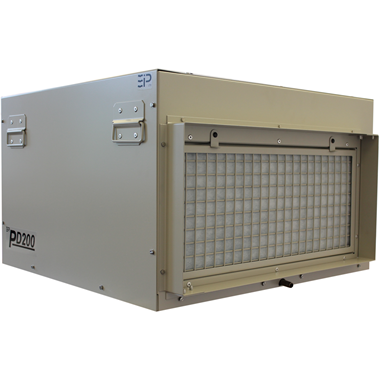 EIPI’s dehumidifiers clear the air in damp interior spaces. Condensation is removed from windows, walls and ceilings. Stuffy air is drawn off and dry air is pumped back in. You simply set the dial and air humidity remains at the desired level. EIPI’s range of dehumidifiers are energy savers. Adjustable control humidistat to maintain the level of dryness, A convenient drain point for condensate collection of hose attachment, EIP’s unique temperature sensitive, “Reverse Cycle” defrosting feature which automatically melts away frost buildup providing effective operation at low ambient temperatures, Quite, 2 speed fan, Self-contained for quick and easy installation – No duct work required, Can be ducted if desired, Sturdy military-type carrying handles, Totally enclosed coils in an epoxy-coated, heavy gauge steel case. The PD range of dehumidifiers are available in 2 sizes, 1HP & 2HP, providing adequate building blocks to allow correct sizing for all applications. Both units are equipped with temperature sensitive defrost, this unique feature ensures full drying capacity across the wide operating temperature range. Underside runners, with predrilled mounting points, along with optional duct flanges ensures installation time is kept to a minimum. Chemicals and water vapor from your pool are constantly evaporating into the air increasing your humidity level. This high, humid air, will soak its way through anything, and equally as bad condense on your walls, roof, floor and windows causing corrosion, wood rot, mold and bacteria growth and an unhealthy environment. To protect your property investment, you need to dry out your home and keep it dry all year long with a properly sized pool or spa dehumidifier.